Load capacity here refers to dynamic load capacity, that is, the load the racking system can take under realistic conditions while driving on rough roads. Modul-System calculates using a safety margin of approximately 3, that is, the maximum measured load capacity divided by three. The dynamic load capacity is verified with vibration testing where vehicle movement during an estimated life is simulated. Modul-System’s products undergo numerous tests before they reach the market. 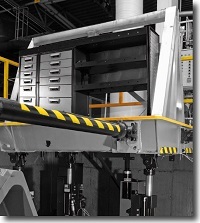 For example, the dynamic load capacity is verified by vibration testing.